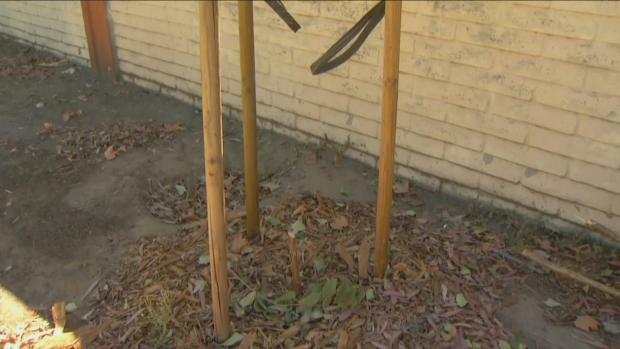 A mysterious tree killer has struck again: A San Jose city councilman said another 23 trees were taken down with what appears to be a chain saw in Willow Glen this week, bringing the total number of saplings killed along a street in his district to 46. Councilman Pierluigi Oliverio confirmed to NBC Bay Area that nearly two dozen trees were found chopped down on Meridian Avenue and Dry Creek Road on Wednesday night. Just as shocked as any Willow Glen resident that someone would do this, Oliverio is offering a $5,000 reward for information leading to the arrest of the culprit. There are no surveillance cameras along the street, he said. Some told the Mercury News that the motive behind the tree killings could be political. In recent months, a vandal poured cans of white primer over colorful art boxes in Oliverio's district. Oliverio told NBC Bay Area on Friday that until he knows who is doing it, he can't speculate on the motives. He couldn't immediately think of any political enemy who would be behind such a "mean and unkind" act. Obviously, though, Oliverio said the tree killer "has some strong issues regarding something." The 46 felled trees, a mix of native California Chinese fringe and yew pine, were planted as a part of a $50,000 project, sponsored by Oliverio’s office. "We all had to take a deep breath because it was stunning," said Rhonda Berry, president and CEO of Our City Forest, a local nonprofit that planted the 10-foot trees last year. She told the Mercury News that the damage estimate was probably about $10,000 — and that's without being able to tally the emotional cost of the savagery of the unusual criminal act. The first rash of botanical homicides was discovered on July 16, when volunteers from Our City Forest program couldn't believe their eyes when they found 23 trees sawed down by a vandal or vandals. Where those trees once stood, there are now signs saying, "These trees have been murdered." "I think the community is perplexed as to why someone would kill trees," Oliverio said. "It’s bizarre." Oliverio strongly suspects that the same person or people who took down the 23 trees on the first side of Meridian Avenue is the same person or people who slashed the second side. "Apparently, they came back to finish the job," he said. The trees will likely be replanted in the fall. "We’re not going to let this mean and unkind vandal set the city back from continuing to beautify things," Oliverio said. The councilman's office will invest the money needed to replant the trees, and when they do, he says they’ll also install surveillance cameras. "We have to keep planting in order to have a healthy city," he said. Meanwhile, neighbors remain perplexed as to why someone is targeting trees. "Someone has got a screw loose," Tim Reiley said.